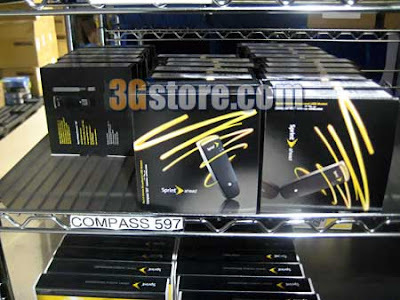 3Gstore.com Blog: Compass 597 USB EVDO modem: Now Shipping! UPDATE: Full review of Compass 597 available -- includes video and photos! Sierra Wireless's latest and greatest USB modem is the uber-tiny Compass 597 USB EVDO Rev-A modem, and once again it will launch first on Sprint's MobileBroadBand EVDO network, before it gets to customers on Verizon. In fact, the Compass 597 became available online this past weekend... but unfortunately, Sprint is not moving at "light speed" with this device and none of the units we have can be activated onto the network. UPDATE! The problem was that Sierra Wireless did not have the ESN's loaded into Sprint's system correctly. Simple as this sounds to fix, it wasn't a quick fix, and took time for the system to finally recognize all the new device ESN's. We were able to successfully activate a new Compass 597 early this morning, so now all of our Compass 597 orders will begin to ship out today! If you've been waiting to get your new Compass 597, order online today!